Out on my run this morning, I saw a white car at the stop sign ahead of me. As I neared, a tiny woman came out and dashed over to me. “You see chihuahua? !” she said to me in broken English, her dark eyes crimped with distress. I replied that I hadn’t, but I asked for a description and her particulars, then assured her that I would let her know immediately if I saw the dog. She returned to her car and I proceeded on my way. 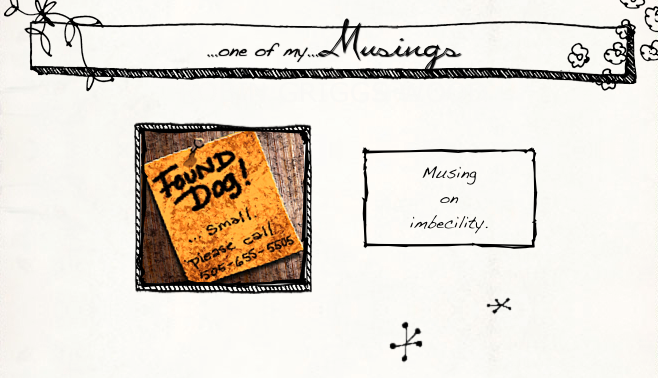 At the corner, a few feet ahead, I noticed a glaring neon sign tacked to the telephone pole, “FOUND DOG, small. CALL . . .” So, I waved to her, pointing frantically at the sign. Mind you this sign, which had been up for three days, was only 20 feet from her own house — a only 12 feet from the present position of her car. She jumped out and bolted over. The person who’d nailed the sign must have been tall, as it was posted at my eye level. Now, seeing as how she was maybe only slightly taller than the chihuahua herself — and I can concede that she probably had her eyes pointed downward all the time looking for the little escape artist — I can certainly understand why she might have missed the sign’s screaming-orange declaration. Or maybe she’s color blind.
. . . AND WITH THE ENGINE STILL RUNNING! I can see now how she lost the dog . . .